Me reading this book = pausing every few seconds to nod head, highlight and secret fist pump that this book exists. And in a grand show of crazy-kindle-highlighting, I ended up with 146 pieces of much loved content! 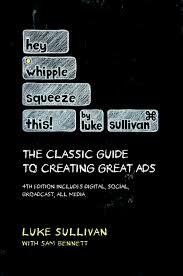 Suffice to say it has now become my absolute favourite (to date) book on advertising and creativity. It’s definitely going on the highly recommended list! I’ve read it twice. Yes, it’s that good! It’s written like a chat with a friend (a v funny one), with none of that corporate speak that makes you feel like a naughty five year old. Did I mention the guy is v funny? Full, brimming, busting, with a serious amount of AMAZING advice. Alright, onto my top 5, top 8 takeaways (I swear I tried to cut down this post, but there’s just too many magic phrases). 1. You gather as much information on the problem as you can. You read, you underline stuff, you ask questions, you visit the factory. 2. You sit down and actively attack the problem. 3. You drop the whole thing and go do something else while your subconscious mind works on the problem. 4. “Eureka! “How can a brand get any attention at all?” The answer: Have better content than everyone else. Grab the book, hell grab 10 copies and give them out to your workmates.